Sometimes people are weird about fusion food. I think it stems from a time when fusion meant foods that went together that just didn’t make sense. Now, I feel like all the best food is fusion, even if it isn’t called fusion. Think Momofuku, Umami Burger, or Kogi. At fusion’s best, it is a mix of what’s awesome about one culture, combined with something ultimately delicious from another. Some of my favorite food is fusion, although I hesitate to call it that. 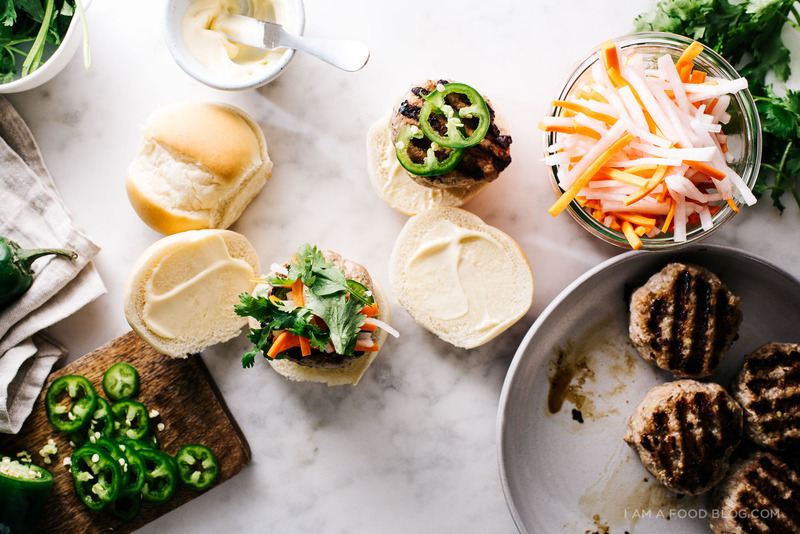 Banh mi burgers aren’t anything new, at least not around here. The things that make a banh mi a banh mi (pickles, pate, cilantro, jalapeños) are perfect on burgers. Then again, what is a banh mi anyway? Banh mi happens to be a kind of fusion food of it’s own – created when French people brought baguettes to Vietnam. 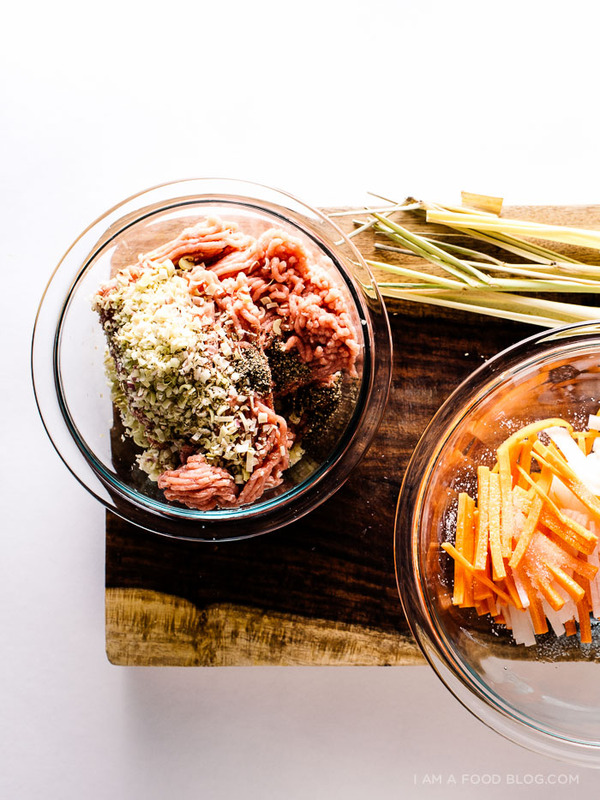 They adapted bread recipes, filled them with traditional meats and herbs and boom: banh mi were born. I had to think for a while about what I should call this burger. Technically, banh mi means bread, so calling it a Banh Mi Turkey Burger means I’m calling it a “bread turkey burger.” It doesn’t quite have the same ring to it…Nonetheless, this turkey burger is absolutely delicious – it’s the best of many worlds: the burger side is adamantly American, the daikon and carrot pickles are proudly Vietnamese, and it’s even healthy, thanks to the Plainville Farms ground turkey. I might be one of the few people who really love turkey burgers. Mike isn’t really a fan, he thinks turkey doesn’t hold a candle to beef. I was pretty confident that I’d get to polish off the whole batch, but then, Mike reluctantly tried one. Surprise, surprise, he actually really liked it – they were just that delicious. So much so that he had ALL of the sliders, minus the two that I smartly ate before he decided to give them a go. I hope you’ve been grilling up a storm now that we’re in the thick of summer. 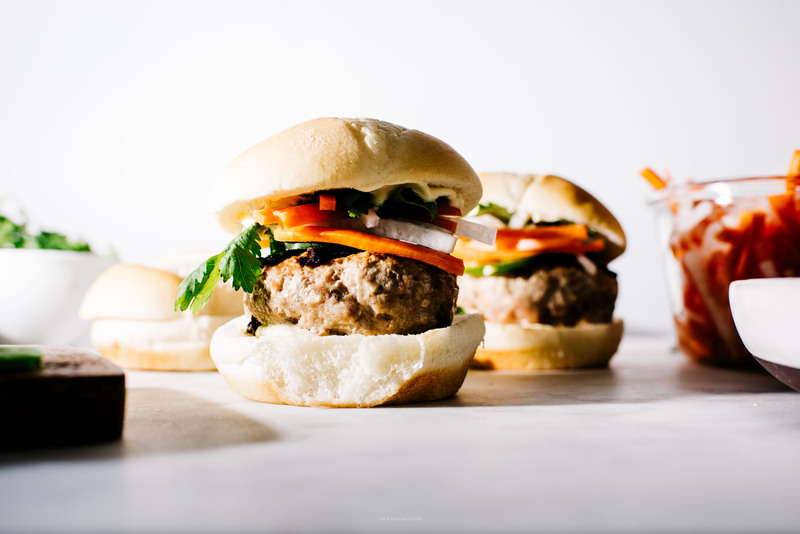 And I hope you grill up some of these turkey banh mi sliders! Make the pickles: put the carrots and daikon into a bowl and sprinkle on the salt and sugar. After 15 minutes, rinse off the pickles, drain well and place in the fridge until ready to assemble. In a bowl, throughly mix the turkey, lemongrass, garlic, fish sauce and pepper. 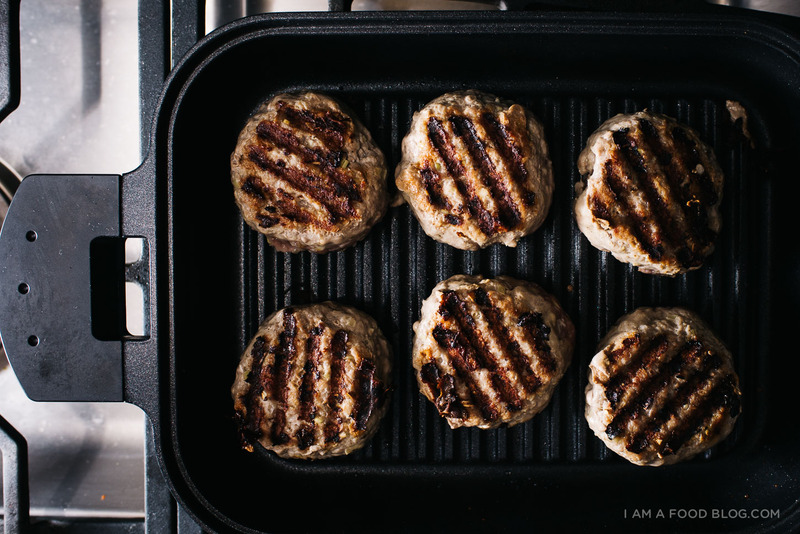 Divide evenly into 6 patties and gently shape. Heat your barbecue to medium high heat. Brush the grill with oil and grill for 5-6 minutes, flip and grill for another 4-5 minutes, or until cooked through (165°F). Build your burger: smear a bit of mayo on the top and bottom bun. 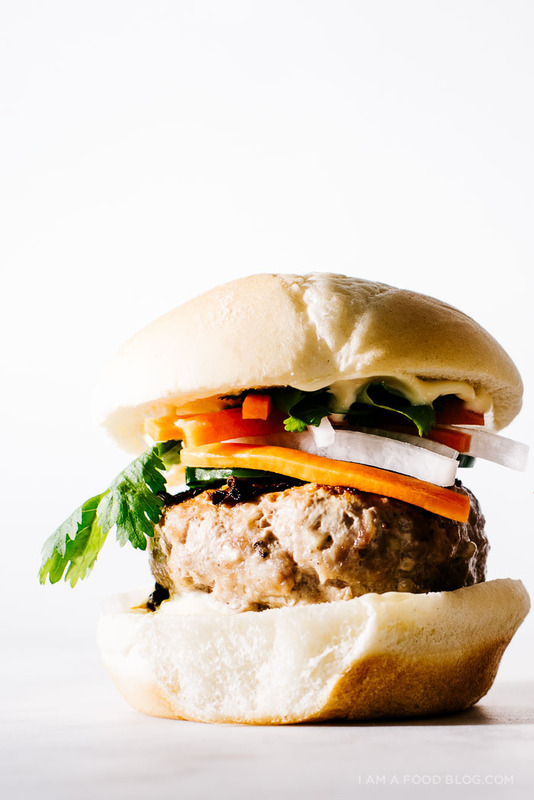 Top with a turkey patty, slices of jalapeno, the carrot and daikon pickles, cilantro, and the top bun. Enjoy! This post was sponsored by Plainville Farms. Plainville Turkeys are vegetarian fed, humanely raised, and never use antibiotics. 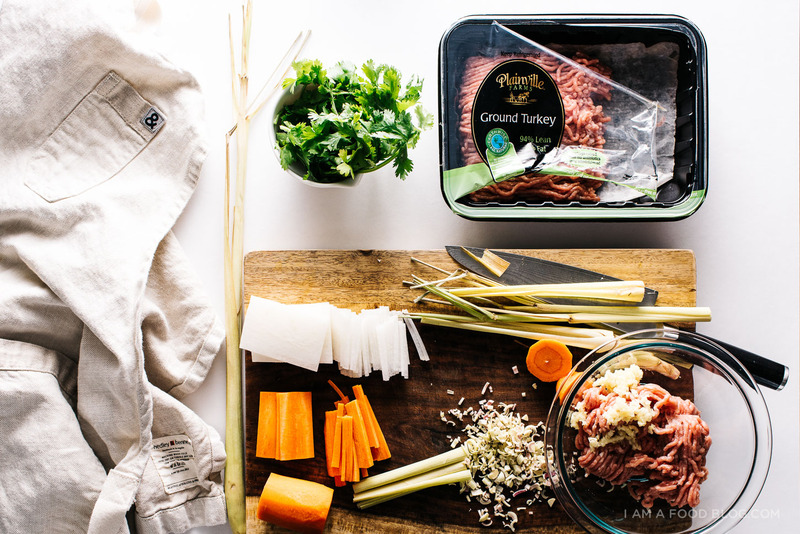 Check out their Facebook or Pinterest for more ground turkey recipes. Thanks for supporting I am a Food Blog! fusion to me is kind of like foodie; people who love food could definitely be described as foodies, and yet it’s developed a bad (or at least not great) connotation. anyways, love the sound of these burgers! though i’d eat all the pickles first and there’d be none left for the burgers. oops. Did you say a turkey bahn mi burger? That is so my kind of burger! Love it! Agree with Heather – it’s likely because fusion has been associated with foodies that it’s gotten a sort of negative rap. But seriously, everything these days is fusion! Basically all food trucks, too! Love this though! I love turkey burgers so this sounds fantastic. Holy heck, these are gorgeous!!! Never was a fan of turkey burgers myself, but I’m drooling so maybe I secretly am a fan? Idk. Good job! Looks Yummy! 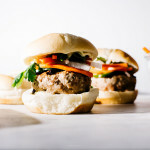 Banh mi typically has pate in it so maybe I’ll make it with a smidge of pate into the turkey burger or spread it on the bun (can’t go wrong either way). Thanks for the inspiration. Love your blog and your pictures are stunning! I LOVE LOVE LOVE turkey burgers. 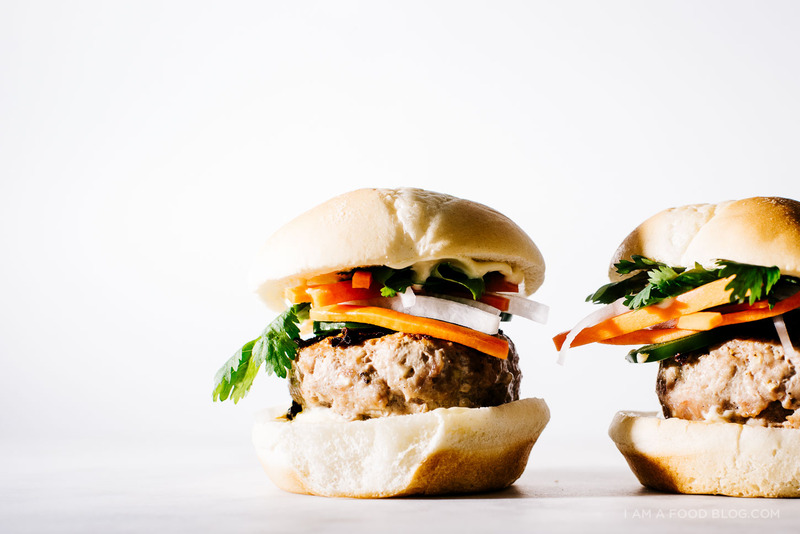 And I’m sure banh mi turkey burgers are even better. I always order the turkey burger if it’s on the menu. So yum. made these tonight and they were awesome!! I used sweet Hawaiian rolls and they were a little too small (I should have made 8 patties) but I’ll still consider it a win!! I also love turkey burgers! I think they are almost separate from a beef or bison burger though. 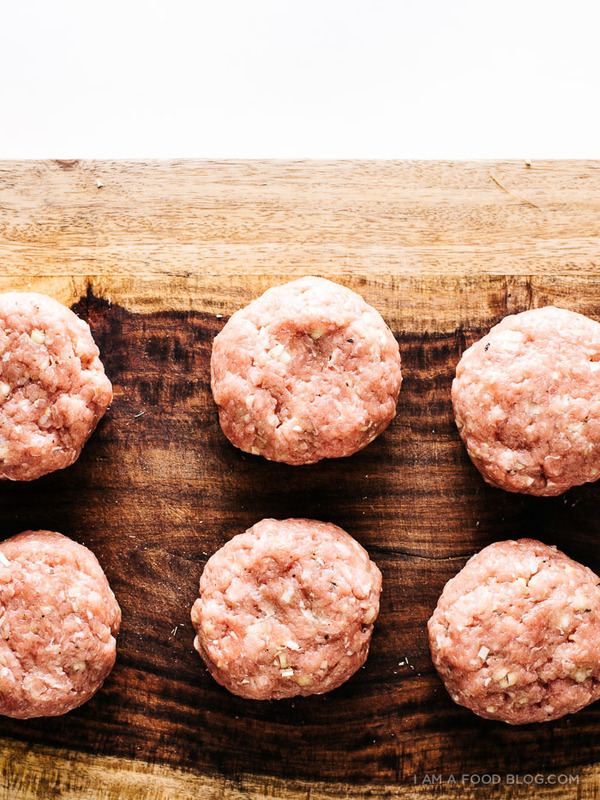 For the person who is expecting a turkey burger to taste like a quarter-pounder, they will be disappointed. For those who don’t have any expectations, they are delightful. Just delicious! We are huge banh mi fans in our household. Recipe was perfect, and I added some sriracha to the mayo since we love heat. Since I don’t eat red meat, I am always looking for new turkey burger recipes, and this one is a keeper.